A low calorie diet gives a target intake of calories each day. A low calorie diet, which may also be referred to as a calorie restricted diet, provides a steady way to achieve weight loss and is usually a key part of weight loss plans such as those used by slimming clubs. A low calorie diet is commonly advised for anyone people with diabetes that is overweight to some degree. The calorie target is designed to be less than the calories your body will expend (through organ functions and activity) through the day, therefore causing your body to break down body fat to cover the calorie short fall. Because of its broad definition, there can be many different types of low calorie diet. So, any low fat diet or any low carbohydrate diet, as examples, that meet the low calorie diet criteria would also be low calorie diets. A low calorie can help you to lose weight at a steady level over an extended period of time and some weeks may produce less pronounced weight loss than other weeks. A low calorie diet is generally not designed to achieve rapid weight loss, but to achieve success over a longer period of time. It is important to aim for a balanced diet whilst following a low calorie diet to ensure you are not missing out on the right vitamins. Don’t fall into the trap of focusing too much on calorie counts and missing out on nutrients from important food groups such as fruit and vegetables as a result. Unless additional restrictions are applied, a low calorie diet will usually allow enough room for the intake of a good range of vitamins and minerals from a variety of food sources. A dietitian can help you to ensure that your diet is well balanced. 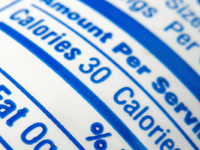 Packaged foods are required to include calorific information, however, in some cases you may need to weigh the food and/or use mathematics to figure out the calorie content of the portion you have. For non-packaged foods like fruits and vegetables, there are a good number of available sources of calorie counting tables which range from books to smartphone apps. Full calorie counts are available at some restaurants whilst some restaurants may list which meals are less than a defined calorie value. If the calorie content is not provided, you may need to try to form a best estimate. Note that when we refer to calories, we are referring to kilocalories, often denoted as kcal. Watch out for the other measurement of energy kilojoules (kJ). 1 kcal is equal to over 4 kJ so it is best not to mix these up. Always look for the energy value in kcal. The NHS recommends that we take 2 and 1/2 hours of exercise a week. Exercise acts as a good compliment to a low calorie diet as it encourages the body to better metabolise the food we take in. When we exercise, we use a form glucose (glycogen) stored in our muscles as well as glucose from our blood. After exercising, these muscles will continue to take glucose from the blood to replenish their stores of glycogen. Therefore as well as supporting weight loss, exercise can also help to keep blood glucose levels down. Many of the slimming clubs in the UK advocate low calorie diets to achieve steady and achievable weight loss. Slimming clubs will often provide meal plans and exercise targets in addition to offering social support and motivation from others taking part in the club.